Most top editors come up through the writing and editing ranks, not from the photo staff, so our default settings favor paragraphs over photographs. But our users engage more deeply with visual images. They always have. 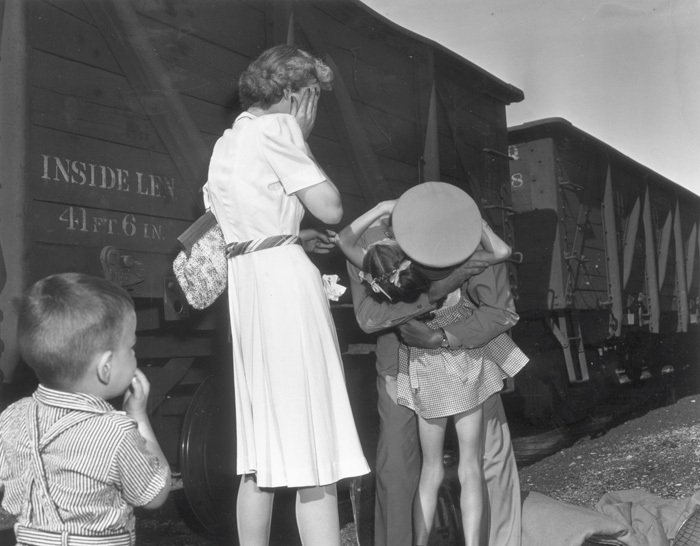 The longest story of my career had its roots in a photograph, the famous Homecoming photograph that won a Pulitzer Prize for Buddy Bunker during World War II. I poured every shred of writing skill I had into the stories I wrote from Venezuela in 2000, but I knew that it was Gary Fandel‘s masterful photos that drew the readers to my words. Quality photos have huge value with digital audiences. News organizations haven’t yet figured out the best ways to generate revenue that fully reflects that value. Newsrooms need to experiment with their approaches to photo coverage. But I can’t imagine how the best approach would be to fire your whole photo staff. 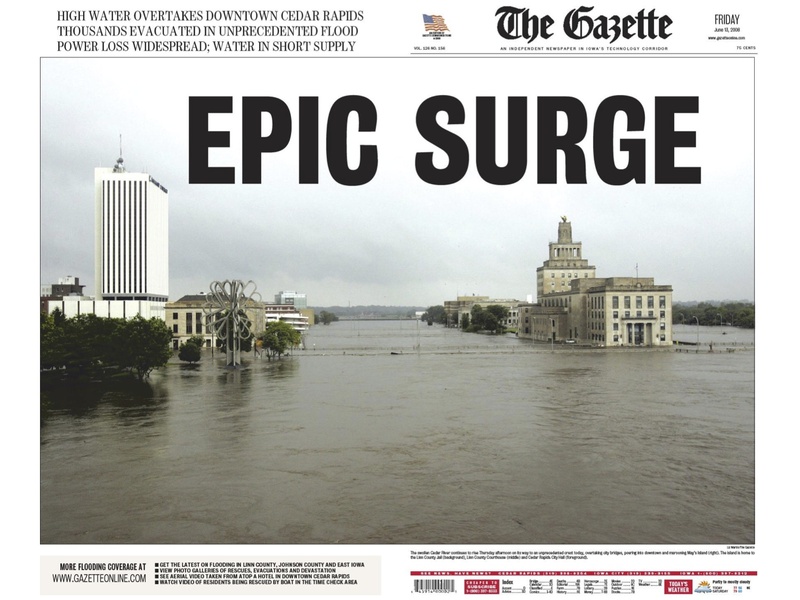 When I was editor of the Cedar Rapids Gazette, my staff covered a horrific flood (beyond the 500-year flood level) on June 12, 2008. * Our reporting staff did a stellar job and drove a ton of traffic. But nothing drove traffic like the spectacular photos taken by our amazing photo staff. The professional photojournalists on our staff — Cliff Jette, Liz Martin, Brian Ray, Courtney Sargent, Jim Slosiarek and Jonathan Woods — took photos that captured the community experience of that catastrophe better than anything else. Their photos were most of the content of a book, Epic Surge, that sold more than 20,000 copies and their work attracted thousands of visitors to an exhibit at the Cedar Rapids Museum of Art, beyond the page views and newspaper sales the photos drove. Yahoo! CEO Marissa Mayerstirred a controversy with her recent comments, in explaining changes to Flickr, that “there is no such thing really as professional photographers.” She clarified, but she also voiced a question that many in the news business have been wondering: If everyone in the community has cameras in their pockets and purses, and they are sharing billions of photos, what’s the value of professional photography today? The cliché about a picture being worth a thousand words is stating an average. The photos I take may be worth a few hundred at best and often just a few dozen. But a stellar photojournalist’s picture can be worth several thousand words. I believe newsrooms need to do a better job of engaging the community to submit photos of community news, life and events for our use. I believe reporters need to shoot more routine photos and videos to accompany their own stories (which the Sun-Times reportedly is planning to do). But I don’t see community engagement or reporter photos replacing the work of professional visual journalists. Those amateur or professional-multi-tasker photographs add to the volume and variety in a medium where visual content engages more effectively than words. We should use that content to free professional photojournalists from doing routine assignments and spend their time heavily, if not exclusively, in chronicling major breaking news stories and producing photo galleries, videos and interactive multimedia projects. The job of a professional photojournalist is changing dramatically, as it needs to. But the value of professionally produced visual content remains high. Every journalist needs to continually assess and update skills. Visual journalists should develop their digital skills and their reporting skills (in many instances, if you can assign only one journalist to a story, it would be better to have a photojournalist tell the story visually, with enough reporting to carry the cutlines and/or the audio, than to give a reporter a point-and-shoot camera to embellish the words). Digital First Media benefits from the video and photo excellence of visual journalists such as Dai Sugano, Craig F. Walker, Joe Amon, Jane Tyska, Rudy Gutierrez, Jason Plotkin, Peter Hvizdak, Leah Hogsten, Tom Kelly IV and many more. We need to develop better ways to make money from their work, but I can’t imagine how our future would look brighter by presuming that our visual content would draw as much attention with the photos that reporters shoot. I don’t have all the answers for how the news business is going to return to prosperity. But I do know that in the torrent of visual content online, quality stands out more than ever. I’d rather figure out the future working with a staff of professional photojournalists than without. How can your newsroom gain more value from professional visual content? Who are the professional journalists who provide value to your audience? *Cedar Rapids is experiencing another flood now. While the forecast doesn’t call for a crest nearly as bad as 2008, I remember how much that flood exceeded forecasts. I hope my old community and old colleagues don’t have as severe a flood to cover as we had then. @louisamestoy @stevebuttryOur J. Haeger @oneidaphoto started w/B&W film then color, digital, video & now Tout. Good visuals are crucial. @stevebuttry I feel like if outlets continue eliminating photojournalist staff positions, we’re going to get a lot more photos like this. @stevebuttry And I say that as a reporter. @stevebuttry expect it won’t be long before others follow suit. Going freelance will be inefficient. Wonder what @umairh view would be? If you’re another Digital First editor (or a leader or former leader in another organization) and would like to propose a guest post as part of the series, email me at sbuttry (at) digitalfirstmedia (dot) com and we’ll discuss. Sue Burzynski Bullard provided such a post on organizational tools. Nancy March wrote one on balancing work and personal life. Dan Rowinski wrote about mobile opportunities.